Damaged hair is something i've dealt with ever since I began dying my hair aged 17, and is something i'll probably always have to deal with. 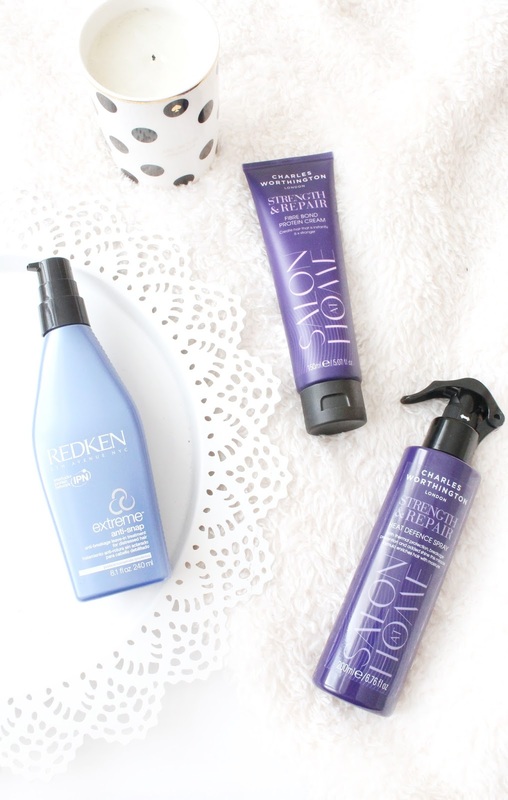 Having said that i've recently been trying out a few products designed to help protect and strengthen your hair and i've began to notice a big difference, so I thought i'd share why i've been loving these products! Now we all know you can't just repair hair, once it's damaged it takes a lot of time and products to get it to a healthier state but restoring hair back to brand new is impossible. Having said that, these products definitely help to strengthen the hair and protect it from further damage. One brand i've heard some incredible things about for protecting hair is the Redken Anti Snap range, of which I was somewhat skeptical about but after having it recommended to me after having my hair done, and an actual hairdresser assessing the state of my hair I thought it was about time I gave it a go! I picked up the Redken Anti Snap Treatment (£18.50) and have been using this for a few months now, and so far i'm really impressed. This is essentially designed to smooth the hair cuticle and reduce friction when brushing or styling the hair with it's exclusive interbond conditioning system. I typically use this once i've washed my hair and i'll apply it throughout my hair whilst it is still damp and it works as a leave in conditioning treatment would. What is also great is that it also has a heat protectant within it, which is great for people like me who forget to use heat protectant sprays from time to time. Typically this doesn't change the appearance or the feel of your hair instantly, however I have noticed how much the damage and breakage of my hair has reduced dramatically, and instead my hair actually seems to be growing would you believe! Another range i've been trying out recently is the Charles Worthington Strength & Repair range of which has been a blessing in disguise for my hair ever since Dove discontinued my favourite hair product last year (i'm still mourning if you hadn't noticed). They recently sent me the Charles Worthington Strength & Repair Fibre Bond Protein Cream* (£7.99) which I think works similarly to the Redken Anti Snap but it is a lot thicker in consistency. It says that it makes the hair stronger 6X stronger in just one use, with strand building protien targeting the inner hair strand whilst also protecting the hair from heat of up to 230 degrees. I've been using this in rotation with the Redken Anti Snap on both damp hair and dry hair prior to styling and I cannot believe the difference this product makes in just one use! I also use this to smooth through the ends of my hair if they are looking dry, and it instantly improves the softness of my hair which i've struggled to find in a product for such a long time! Another product that I picked up from the range after being so impressed with the cream is the Charles Worthington Strength & Repair Heat Defence Spray (£7.99) mainly to use in between the other two products for when i'm in need of an instant solution to protecting my hair from heat damage. simiarly to the cream it protects against up to 230 degrees of heat, but one thing I have learnt with heat protectants is that you should really give your hair a blast with a hair dryer before applying styling tools directly to the hair, as this kind of defeats the idea of a heat protectant in the first place. Again i've seen how less dry and brittle my hair feels since I started using this, as I think some heat protectants don't do a thing, and in turn damage your hair even more but not this! What products to you use to combat damaging your hair?